As a leading roofing contractor and home improvement specialist here in Austin, Texas, Dustin Johnson Exteriors & Roofing recognizes the fact that every homeowner or property manager has a vast list of upkeep responsibilities for their home or business. Apart from the core roofing tasks, such as roof replacement and roof repair, another home exterior feature that should also be given enough consideration is the siding. Siding brings a fresh new look to your property, be it your home or business. When installed properly by a reliable siding installer like Dustin Johnson Exteriors & Roofing, you will definitely have a versatile array of decor options that will greatly improve the aesthetics of your property as well as its value. As an experienced home improvement specialist whose siding service is unrivaled here in Austin TX, we highly suggest the use of siding instead of having a tedious paint job. As such is highly recommended because siding will require significantly less maintenance; thus, eliminating the trouble of constant repainting and other laborious tasks. Here at Dustin Johnson Exteriors & Roofing, we want what is best for you. That is why we partnered with James Hardie® for our siding services and products. Apart from being an industry-authority when it comes of fiber cement, James Hardie and its products are being utilized by our company because of their emphasis on product quality and production efficiency when developing low maintenance and durable siding products. With their innovative research and development, James Hardie managed to maintain their pre-eminent position in the industry for more than 1 century now and counting. While siding materials and products are important in delivering a reliable and long-lasting protection to your home or business, you should also look into the process of installation or replacement. Here in Austin, Texas, homeowners trust Dustin Johnson Exteriors & Roofing when it comes to siding services. We are confident enough to complement the quality and durability of our James Hardie siding products. It is made possible through our highly competent and skilled siding installers and project managers who have undergone series of lectures, training, and seminars concerning siding installation and the siding products we utilize, James Hardie sidings. 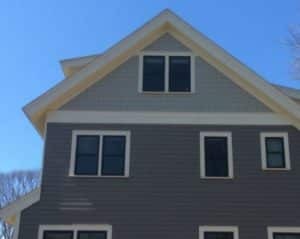 To put things into perspective, siding comes in a variety of materials as well as manufacturers, but we only make use of the best materials coming from James Hardie to complement our expertise and experience in siding services such as siding installation, siding replacement, and repair. If you desire energy efficiency, low maintenance, durability, and improved aesthetics on your property, you should seek for top-notch siding products and siding services. And here at Dustin Johnson Exteriors & Roofing, we have both to offer. Check What They Are Saying Our About Our Services! To know more of our home improvement services, including siding, gutter, window, garage door, and roofing service, you may contact us at (512) 337-2661 or visit our office centrally located at 901 S MoPac, Expy building 1, #300 Austin, TX 78746 for a personal consultation and free estimate. Contact Us Today.